Putting Bermuda ‘on the map’ is Tyler Butterfield’s goal when he competes at the Commonwealth Games in Glasgow this summer. 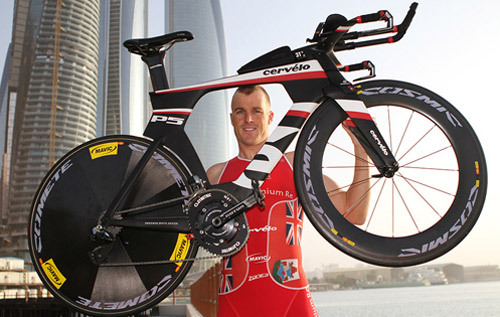 The popular Ironman athlete, 31, is still basking in the glow of his Abu Dhabi International Triathlon win last month. However, improving on his seventh place at the Ironman World Championships in Kona, Hawai’i remains his top priority because it ‘defines your career’. But Butterfield, who was recently crowned the island’s male sportsman of the year, understands the value of putting this island on the big stage as much as possible in Scotland in July as well as in Rio during the Olympics in 2016. These events mean he has to drop down in distance, something that goes against his body’s skill set. He told the Sun: “It’s hard because I am much better suited with my natural talent to Ironman. “I got tested recently and it showed I have no anaerobic [ability] but my endurance flew off the chart! The doctor said that is ‘100 per cent why you are better suited to Ironman’. “But the thing is the Olympics is huge and I am definitely going to try to represent Bermuda for the third time. He added: “At the Commonwealths I’d like to have a strong performance. With the Brownlee brothers [Alistair and Jonny], they are generally in the front pack that is just so fast. If I can get up in the front group, that would be incredible. Butterfield admits that with a medal realistically not on his radar at the Commonwealths, the race will be used as speed preparation for Kona. “Kona defines your career,” he said. “If you are top five, you make the press conference after the race. The top three people are remembered five years from now — so that’s the ultimate. “Last year going to Kona and getting seventh – there were some top athletes in front of me but there were a lot behind me that I beat.